The Supergirl Jam in Venice featured a street course complete with a four flat four stair with hubbas and a center rail, euro gaps, ledges, a quarter pipe and a five stair with handrails. The event started with an extensive AM contest. It’s great to see amateur divisions in girls’ contests because it gives up-and-coming girls an opportunity to prove that they deserve to be considered in the decisions on who is to be invited to upcoming contests. The format was a type of AM face-off in which pairs of AMs skated in head-to-head elimination rounds to compete for the two available slots in the PRO division. 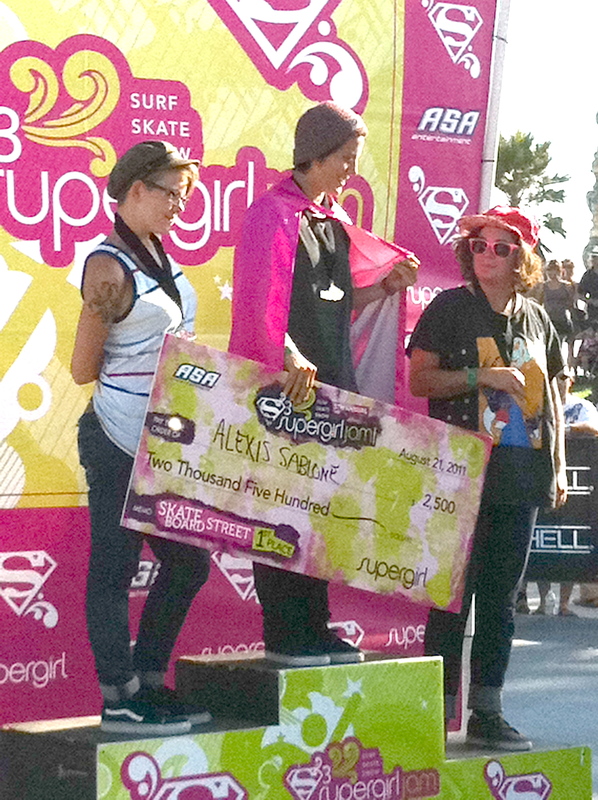 Congratulations to Samarria Brevard and Chelsea Castro for being the top two AMs and holding their own against the pros. The pro contest format presented high-energy skating with timed jam sessions on individual features. As soon as the timer started, the girls rushed to throw a barrage of simultaneous flip and rail tricks down the sets. From a spectators perspective, it was a great presentation of these girls’ talent and dedication, but I would have hated to be a judge. So much went down!!! Lacey Baker (who was hobbling with a cane just a few weeks ago at the X-Games) flawless hard flips, frontside flips, fakie fs front heels, inward heels. Alexis Sablone- kickflip up the euro gap into a nose manual across the entire section of the course. Congratulations to all of the competitors, everyone skated really well!